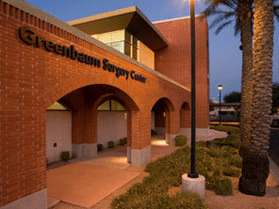 Greenbaum Surgical Center is located in Scottsdale, AZ just over 5 miles from our plastic surgery office. Greenbaum is part of the trusted HonorHealth Medical Group, a group of hospitals and medical centers that serve the Phoenix and Scottsdale communities with over 3,000 physicians and almost 12,000 employees in total. Greenbaum Surgical Center offers a wide range of services to their patients, including breast procedures, cosmetic surgeries, brain operations, orthopedic, and much more. Our board-certified plastic surgeon, Dr. Meger, is proud to hold practicing privileges at this surgical hospital and he trusts the medical staff to fully devote themselves to his patients.